OK, Peter Doig may have tried LSD a few times when he was growing up in Canada during the 1970s. But he knows, he said, when a painting is or isn’t his. So when Doig — whose eerie, magical landscapes have made him one of the world’s most popular artists — was sent a photograph of a canvas he said he didn’t recognize, he disavowed it. The owner, however, disagreed and sued him, setting up one of the stranger art-authentication cases in recent history. The owner, a former corrections officer who said he knew Doig while working in a Canadian detention facility, said the famous painter created the work as a youthful inmate there. His suit contends that Doig is either confused or lying and that his denials blew up a plan to sell the work for millions of dollars. Doig, 57, has compelling evidence he was never near the facility, the Thunder Bay Correctional Center, about 15 hours northwest of Toronto. “This case is a scam, and I’m being forced to jump through hoops to prove my whereabouts over 40 years ago,” he said. To Doig’s surprise — and the astonishment of others in the art world — a federal judge in Chicago has set the case for trial next month in U.S. District Court. Art-law experts say they can’t recall anything like it, certainly not for a major artist like Doig. “To have to disprove that you created a work seems somehow wrong and not fair,” said Amy Adler, a professor at New York University Law School. The stakes are high. A Doig painting has sold for more than $25 million. Other works have routinely sold at auction for $10 million. The plaintiffs, who include the correction officer and the art dealer who agreed to help him sell the work, are suing the painter for at least $5 million in damages and want the court to declare it authentic. They have focused on what they say is a hole in Doig’s teenage years in Canada when, they assert, he cannot fully account for where he was or what he was doing. “Every artist has destroyed work,” said William Zieske, the lawyer for the painting’s owner and the art dealer. The retired corrections officer, Robert Fletcher, 62, said he bought the painting for $100 from a man named Pete Doige (spelled with an e), whom he met in 1975 in Thunder Bay, Ontario. The young man he knew was taking art classes at a local college, Lakehead University, and said he was, like Doig, from Scotland. 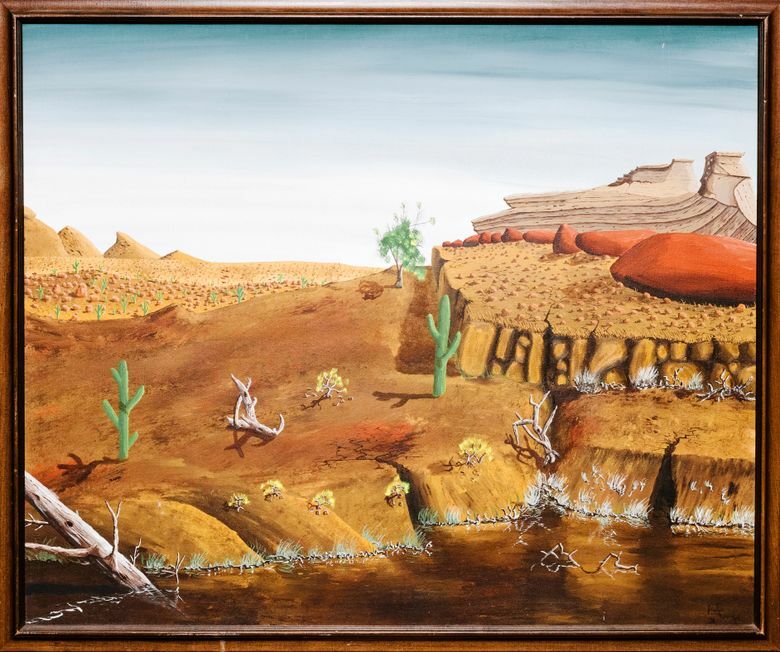 After an LSD offense sent the man to a prison farm where Fletcher worked, he saw the young artist create the untitled acrylic canvas of a rocky desert scene. “I am 100 percent convinced that this is the man and that this is the painting I own,” Fletcher said in an interview. He became the young man’s parole officer and also helped him find a job through the Seafarers International Union. He said he bought the painting because he feared Doige might go back to selling drugs. About five years ago, a friend noticed the painting on Fletcher’s wall and said it was by a famous artist. When Fletcher pulled up a video and watched Doig speaking at a college, he said, he recognized his expressions and mannerisms, and now feels let down by someone he believes he helped, and also wants to be proved right. Fletcher, who lives in Sault Ste. Marie, Ontario, consigned it to a gallery in Chicago on the recommendation of his brother, who lives there. The gallery, run by Peter Bartlow, contacted an auctioneer. A Sotheby’s specialist, to whom they sent an image of the picture, said it was “rare to see such a complete and highly resolved early painting by Doig” and said it had Doig’s “trademark eeriness of the empty landscape,” though she later said she never inspected it firsthand and did not authenticate it, according to court papers. Doig, however, said they are taking advantage of the similarity in two people’s names to profit from a far-fetched tale. Yes, he grew up in Canada before attending art school in England. But in 1976 he was only 16 or 17 and lived in Toronto. He has never been to Thunder Bay, he said, and was never incarcerated. He denies there are similarities to his own works. “I did not begin to paint on canvas until late 1979. (Before that, I had done some pencil and ink drawings on paper),” he said in court papers. Doig and his lawyers say they have identified the real artist, a man named Peter Edward Doige. He died in 2012, but his sister said he had attended Lakehead University, served time in Thunder Bay and painted. “I believe that Mr. Fletcher is mistaken and that he actually met my brother, Peter, who I believe did this painting,” the sister, Marilyn Doige Bovard, said in a court declaration. The prison’s former art teacher recognized a photograph of Bovard’s brother as a man who had been in his class and said he had watched him paint the painting, according to the teacher’s affidavit. Fletcher and Bartlow have no record of Doig being imprisoned in Thunder Bay, but they said that’s because he was a minor and his records were probably expunged, or paperwork was just lost. Doig plans to present records, school documents, correspondence, photos and testimony to show, he said, that he never attended Lakehead University and that during the months in 1975 and 1976, when he is said to have created the painting, he was in Toronto or working on oil rigs in western Canada or traveling abroad. Judge Gary Feinerman of U.S. District Court for Northern Illinois decided in April the dispute could be resolved only at trial. But even if Fletcher wins in court, the victory could prove hollow. With the artist himself and the dealer representing him saying it’s not a Doig, the art market is unlikely to assign the painting much value, art experts said.